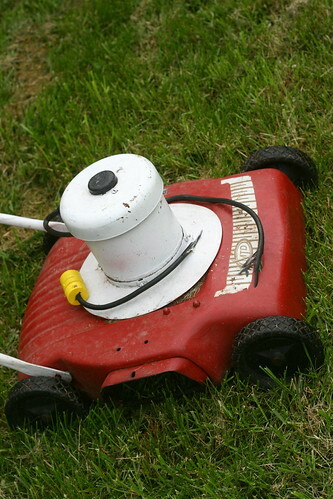 It should not take a particularly acute observer to note that as an electric lawnmower with a severed cord, very little now depends on this particular piece of machinery. This fine item was a $10 yard sale purchase and vaguely resembles the souped up, gas guzzling lawn mowers of today. Vaguely, in that it has four wheels and a rotary blade designed to cut grass. I affectionately refer to this as “The lawn mower of the future” from the 1950s. Sometimes I think the same folks that drew the Jetson cartoons got together to dream this up. Futuristic looks notwithstanding, this lawnmower cut grass like it was from the distant past. This is to say that part of what depended on this mower was a full morning of dragging extension cords, passing over the same spot at least twice and finishing with grass that was only slightly shorter than when you started.2 So what else depended on this red mower? Well, for starters my love of all things thrift – did I mention it only cost $10? Adequate storage space also depended on this small footprint yard cutting machine. You see, we live in a townhouse with no more than about 250 square feet of lawn to mow. And storage space for a lawnmower being at a premium. This mower was adequate for the size of our yard and fit in our small storage closet outside. Oh, did I mention I only paid $10 for this magnificent piece of machinery? Now, I won’t go into the gory details of how the power cord came to be severed.3 Suffice it to say that this lawnmower’s end was bittersweet. I was, of course, disappointed to lose a reliable, if somewhat cumbersome, implement. But I was also relieved to be rid of the constant cord dragging and inefficient use of time that appertained to using this beast to cut our grass. Plus, the handle on the new mower folds twice which makes the handle more storage-friendly than that of its predecessor. 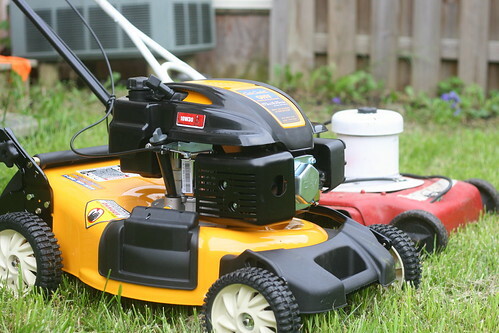 So now a new – gas powered – mower sits in our shed, waiting for a weekend when it’s not raining, we’re in town and baby Zeke is cooperating long enough for me to go out and cut the grass. Fortunately, the time it takes to accomplish this task is dramatically shorter due to the lack of cords and the efficacy of new steel blades. The new mower may not be as environmentally friendly, and it certainly lacks the vintage style of my old faithful.5 But, as the ancients teach us, all things must pass. So I’ll pour the first sip of gasoline as a silent eulogy each time I fill up the new tank and remember the good times fondly before cranking up the two-stroke and joining the rest of suburban America in the national weekend pastime of revving engines in the pursuit of the perfectly manicured6 lawn. 1 While technically I did not even end up with an English minor, I did take a fair number of classes as an undergrad in the department and later took a Masters Degree in Religion and Literature. 4 Primarily befuddlement at the prospect of paying more than $10 for a piece of equipment to be used for the maintenance of a, quite frankly, puny area of lawn. 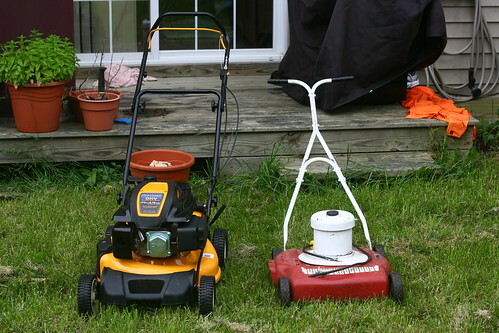 If you were as thrifty as you claim, you would have slapped some electrical tape around that cord and been mowing in minutes! Not to lament what might have been, but why the immediate jump to the “must-be-gas-powered” criterion? 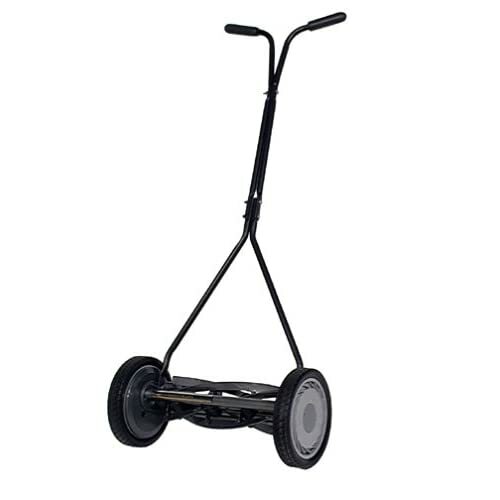 I’m currently very happily enjoying the use of an American Lawn Mower Company 16-inch hand-push reel mower: no gas, no batteries, no power cord. And it works wonderfully. At less than $100, I’ll go head-to-head with anybody on a half acre or less. But who am I to prompt a second-guess? After all, Walter has a point! BP – glad you have good results with the hand-push. We had one and about all I got out of it was blistered hands. Unfortunately, most of the electrics I had looked at didn’t seem small enough to fit in our storage shed. I was also tired of lugging cords around and running them over. This was the third time we ran over a cord – just the first time it got completely severed.